Notes: Fourth season of Sailor Moon, based on the Dream Arc of the Sailor Moon manga (though VERY loosely) by Naoko Takeuchi, which originally ran in Kadokawa's shoujo magazine Nakayoshi from 1992 to 1997. The manga was originally available in North America from TokyoPop, though it should be noted that most of the characters' names are different, and the manga is flipped. In 2011 Kodansha Comics released a new English version that's unflipped, unedited, and uses the Japanese names of all the characters. One day, as Usagi, Chibi-Usa, and their other Sailor friends are watching a solar eclipse, a mysterious tent flies over Tokyo. The tent belongs to a new evil called the Dead Moon Circus, led by the evil Queen Nehelania. Her accomplice, Zirconia, is given the task to find one with pure dreams, for that person apparently holds Pegasus, whose capturing could help them rule the world. Zirconia sends out two groups - first the Amazon Trio, and later the Amazoness Quartet - to do just that. But wouldn't you know it! Chibi-Usa of all people stumbles across Pegasus in her dreams. He promises to keep his identity a secret in exchange for new power ups for their fights against the Dark Moon Circus' minions. By the time Sailor Moon SuperS aired in 1995, the Sailor Moon franchise hadn't just shown its age; it had already graduated to college and left the workload to younger kids. Yes Sailor Moon SuperS is more of a re-invention of the franchise than a continuation of the last season, Sailor Moon S. Chibi-Usa is now our main lead, and the series focuses almost entirely on her and her school life, her friends, and tackling issues like going to the dentist, or learning not to judge others by their initial appearance. And let's not forget her friendship with Pegasus, a talking pegasus from a dream world who tells her to help him and his kingdom while revealing very little else about himself until the finale (as common in Sailor Moon). And Chibi-Usa met him in a dream she had, in a flower-filled dream world, touching him while sappy music played in the background. And the two develop in what I guess is a bond, which becomes a little weirder come the finale as well. Weird Pegasus friendship aside, Chibi-Usa makes for a decent heroine. She is a little Mary Sue-ish in that she, unlike Usagi, gets mostly perfect grades, is actually competent, and is liked by most everyone, but she remains sympathetic and does indeed have flaws. She has her moments of challenges as a kid too after all. Still, I don't see why they decided to give her her own cat guardian (Diana, whose debut episode is one of the season's worst episodes), especially one with such an irritating voice who, unlike Luna, doesn't really guide her or anything. But hey, little kids probably liked her, so who cares if I don't? Chibi-Usa's being the new heroine does unfortunately result in Usagi going through a complete 180 of her own character, but I'll get to that later. Of course, we can't forget the villains, and hoo boy do I have some stuff to say about them. This season takes place at the Dead Moon Circus, and with it some of the weirdest, funniest monsters of the day in the series (three related spheres, a dancing nutcracker, clowns, a monkey woman who mimics the Sailor Soldiers' attacks, etc.). And since this season takes place in a circus, the goofiness is actually somewhat justified here. Our first trio of evil henchman in Sailor Moon SuperS are the Amazon Trio. While we've seen the male underling shtick already in the series, the Amazon Trio are more along the lines of bumbling American cartoony villains than their earlier, more serious counterparts. Whereas the Dark Kingdom generals tried to hurt and even kill one another, the worst the Trio do to each other is steal their targets and maybe get into a goofy confrontation. They also have awesome Japanese voices, too, with the highlight being Tsohio Furkawa (Ataru, Urusei Yatsura) as Hawk's Eye. Tiger's Eye, the blonde leader, goes after little girls. Hawk's Eye, the pink guy in a pink toga, goes after adult women, ranging from 20 to their 60's. Fish Eye, the blatantly gay one, goes after guys. Despite that, it does allow for the series to have some decent set-ups for episodes (modeling, beaches, parties, even kendo fights). Their monsters of the day are even modeled after their personal preferences, which is kind of a neat touch. There's also much more variety in ideas here with the Dream Mirrors than with Sailor Moon S's Pure Heart plots, which mostly revolved around big-name actors and performers. And let's not forget Zirconia. Zirconia is hands down the creepiest villain in the series' history, and her equally unnerving voice is provided by the awesome Hisako Kyouda. Later on we learn that she's also quite powerful, with more than enough in her roster to take down the Sailor Soldiers near the end of the season. Later the Trio leave and are replaced by the Amazoness Quartet, four young girls who also share a pretty tight bond with one another. They mostly target kids and have various stereotype personalities; Jun-Jun's a tomboy, Ves-Ves is a fiery leader, and Cerle-Cerle is the proper one. The only standout of the Quartet is Palla-Palla, who's usually innocent and childish, but also very twisted on the inside. (She's also the only one of the Trio or Quartet who goes after multiple people at once. What a concept.) Still, they're geniuses compared to Eudial and Mimette. Let's now talk about Sailor Moon SuperS Usagi. Oi vey: Usagi has turned into alternatively a brain-dead teenage child and a bully, depending on the mood the episode needs her to be in. The once competent, clever, selfless, spunky, strong girl we knew from the first three season is all but dead now. Occasionally the spark of "Classic" Usagi shines through, but not often. And Mamoru is pretty just window dressing at this point. On yet another upside, the art and animation are at the series' best. Some episodes (like the little girl who idolizes Rei, or the episode where Ami gets obsessed with a song from the Internet) are some of the most gorgeous episodes in the series. One episode even begins with a really nice, watercolor-esque design (episode 158), though it's only in the first few minutes of the episode. So if I sound conflicted in my Sailor Moon SuperS review, it's because I am. There's a lot to like (light-hearted humor, fun villains, decent comedy at times, good art), but also really annoying aspects (underwhelming chief villain, Chibi-Usa focus, supporting characters set aside, dumbed down Usagi). 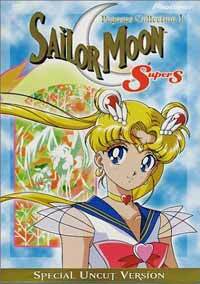 I like it better than Sailor Moon S, but not as much as the first two seasons. If you can stomach Chibi-Usa and don't mind Uranus/Neptune being gone, I think you'll find a lot to like here. In some ways, I'm of two minds regarding this show. Like Tim mentioned, for once the goofy monster-of-the-week setup suits the circus backdrop somewhat, which made the goofy enemies (and yes, these are some goofy enemies) look more like they belonged. Kind of like clowns in horror movies; funny, but an underlying feeling of menace. The show's finale also kept up the feeling of dread and peril the other seasons also had. Then again, given that I willingly went through three seasons so far of a show centered around magical jewelry granting powers, I have to say this; Sailor Moon SuperS is excessively girly. Vastly more so than the earlier seasons, and maybe somewhat ironically closer to its manga counterpart in that regard. SuperS whips out the bling and a white winged unicorn. And I'm not just saying Chibi-Usa befriends an unicorn; she meets said unicorn in her dreams, in a field of flowers and head-touching that will make the flowery stuff in Maria Watches Over Us positively manly and mundane by comparison. And it's in those dreams he proceeds to give her a bell and a promise to revisit her in her dreams to remind her how special she is. Said bell also becomes her super-girly special move that she ran in tandem with Usagi's scepter and my GOD, did hearing the line "Please Pegasus, protect people's dreams! Crystal Twinkle Bell!" get tiresome real quick. Yes, there were some variations to it, but you get the gist. I said it was going to get worse in my contribution to Tim's review for Sailor Moon S, but by and large, SuperS wasn't really a worse show. The give-and-take ratio was a good deal bigger compared to earlier seasons due to the aforementioned factors, but all in all, it was a good show. And that's why Stars ended up hurting so very much when we finally got around to it.